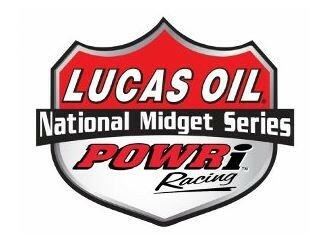 MACON, Ill. – A full throttle weekend roars into Lincoln Speedway Friday night when the POWRI Midgets and Outlaw Micros take center stage in a program that also includes racing in two stock car classes. The wildly popular POWRi series enjoys its appearances at the quarter-mile oval, and the show is part of speed carnival all weekend with racing also set for legendary Macon Speedway and historic Springfield Mile at the Illinois State Fairgrounds. POWRi cars show off their agility and power around the Lincoln oval. With the Tony Bettenhausen 100 for USAC Silver Crown cars racing at the Illinois State Fair Saturday afternoon, the POWRi series running double features at Macon Speedway Saturday night and the Central Illinois SuperChevyStores.com 100 for ARCA stock cars Sunday at the state fair, the big names in dirt track racing are expected to converge on Central Illinois for an all-star weekend. Pro Late Models and Modifieds are also racing at Lincoln Speedway. Gates open at 5 p.m. with racing at 7. On Saturday, the Tony Bettenhausen 100 takes the green flag in a historic race on the mile dirt track at the Illinois State Fairgrounds. USAC Silver Crown cars thunder down the straightaways and slide through the corners. Galesburg resident A.J. Fike goes for a three-peat on the Springfield Mile after a late pass last season. The biggest car count in years is expected for the USAC counts with more than 30 likely to arrive in the pits. Silver Crown practice starts at 9 a.m. with qualifying at 10:25 and the feature set at 2 p.m. Sportsman Nationals heat races are set to go at 11 a.m.
Macon Speedway hosts double features in both POWRi divisions after a rain halted a program earlier this season. A year ago, Brennan Poole captured the win after Kelly Kovski and Fike were black-flagged for jumping a late restart. Kovski is a Springfield racer who was attempting a rare win by a hometown driver on the famed mile. NASCAR star Ken Schrader, a former race winner, will be going for another win. Practice starts at 9 a.m. with qualifying at 11:15 and the 100-lap race at 1:35 p.m. NASCAR star Ken Schrader, a former race winner, is back for more and ready to win again. The Sportsman Nationals will also race a feature at noon.